The Republic of Cyprus is a relatively well developed country in the eastern Mediterranean. The island state has been a member of The European Union since 2004 but the northern part of the island has been occupied by Turkish troops since 1974. For the government controlled area of Cyprus, it has a GNI per capita of US$26,110 (2012) and has seen GDP growth of 0.2% per annum 2008-12. This growth has been secured despite forced movement of the population and loss of resources due to the occupied north. Its tourism and offshore financial services sectors have seen the biggest growth, while the traditionally important agriculture sector has declined. The country has a market economy which is dominated by the service (financial and tourism) sector (79% of GDP). Cyprus exports some manufactured goods, agricultural produce (citrus and potatoes), some pharmaceuticals, garments and tobacco products. Tourism and financial services are the most important economic activities. Cyprus’ financial system is large and sophisticated due to its traditional role as an international and regional financial centre. In 2009 the country’s banking sector assets represented 69% of GDP, a larger percentage than that of the UK or Switzerland. There is a considerable and growing presence of foreign banks in Cyprus, accounting for approximately 40% of total banking assets. Co-operative banks are also important, with assets that equalled 70% of the country’s GDP in 2008. 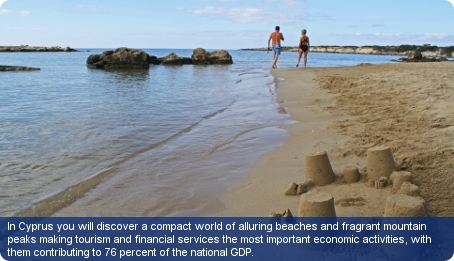 Since independence tourism has played an important role in Cyprus’ economy and the country has developed into one of the Mediterranean’s main tourist attractions.The direct contribution of the tourism sector is 6% of Cyprus’ GDP (World Travel and Tourism Council – WTTC – estimate, 2011). Some 27,000 jobs are supported by the tourism sector with a further 50,000 supported indirectly (WTTC estimate, 2011). There were over 2.4 million tourist arrivals to the country in 2007. Oil and gas exploration was under way in 2011 and large offshore finds of natural gas were announced in December 2011, amounting to an estimated 140-230 billion cubic metres. The economy of the Turkish-controlled north has only 45% of the per capita GDP of the south. Economic growth tends to be volatile, given the north’s relative isolation, EU trade sanctions, bloated public sector, reliance on the Turkish lira, and small market size. Cyprus is a net importer of goods and services with net imports accounting for 11% of GDP (2008). The average ad valorem tariff for imports into the EU is 5.6%. The geographically strategic location of the island state has contributed to the development of an extensive port infrastructure and a merchant fleet that is ranked 10th in a list of maritime nations. Internal accessibility is conducive to business as Cyprus is served by a network of approximately 12,200 km of road, of which 65% is paved. The country has a well-developed port infrastructure which supports Cyprus as a regional shipping hub. Although globally Cyprus is ranked 40th in the world for ease of doing business, among Eastern European and Central Asian countries it is ranked 5th best and first best for resolving insolvency, according to the World Bank’s ‘Doing Business 2012’ study. These rankings measure the conduciveness of a regulatory regime in starting and operating a business. The official languages are Greek and Turkish, though English is also widely spoken. The island ranks among the leading countries in the world in terms of the proportion of university graduates and, in 2010, tertiary-level graduates constituted over 37% of employed persons.